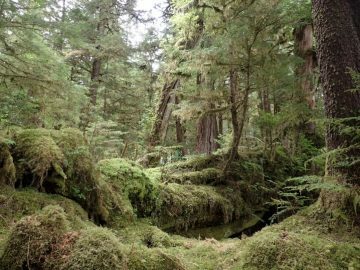 During this year’s foray a small group of bryologists went to some of the places in Haida Gwaii that Wilf Schofield visited many times in his career. Karen Golinski did the research and organized all the trips for the foray; thank you Karen! The first full day, June 19th, offered a floatplane trip to Takakia Lake; June 20th, a boat trip to Limestone Island or the alternative trip to the Dover Trail near Sandspit, and June 21st a boat trip to Government Creek. All the trips were on or near Moresby Island. Takakia Lake is at the northern part of Moresby Island and south of Moresby Camp. The lake is in the Mountain Hemlock biogeoclimatic zone, while the Parkland landscapes above the lake are under Wet Hypermaritime influence. Sandy Davis: “… now that I’m home and thinking back over our fantastic trip, it almost seems like it was a dream. So many great trips and bryophytes, and best of all being with bryologists and botanists! What a lovely day we had at Takakia Lake. We were initially worried about the weather and clouds for landing the float plane, but the day was warm (mid 20’s), and sunny. It was an exciting flight for all of us, and a first float plane experience for some of us. Upon landing at the lake shore, we were greeted by hundreds of Shooting Stars. We headed up the west facing slope to look for Takakia lepidozioides. We checked out the shady areas along the creeks and amongst the seepy rock outcrops. Success! We found Takakia! Other bryophyte collections were made across the slopes and uphill to the north ridge. It will be wonderful to add more species to the database for Takakia Lake. 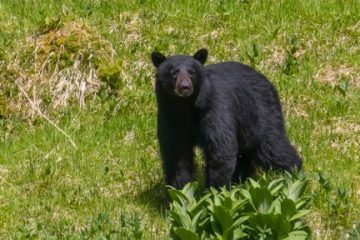 During our search, some of us were looking downhill towards the lake, taking photos of the spectacular scenery, when we noticed a large black bear had come to check us out. The bear wasn’t interested in bryologists and took off after a bit. I later found out that there were 2 black bears in the area. This trip was offered for both the Schofield Bryophyte foray and Botany BC. A zodiac transported the participants to East Limestone Island, south of Louise Island. On Limestone Island, the Laskeek Bay Conservation Society members met the group on the beach and showed some of the ongoing research projects on terrestrial and marine ecosystems. The projects included the effect of deer browsing on the vegetation, as well as bird population recovery projects. 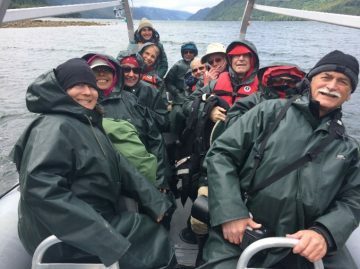 After a catered lunch on the beach the group climbed back onto the zodiac and headed for K’uuna Llnagaay (Skedans), an ancient Haida village. At K’uuna Llnagaay village a Haida Gwaii Watchman welcomed the group, gave the group a tour and told stories about the village life during the days when the village was still occupied. Three members did not join the main group for the trip to Limestone Island, but rather they explored the streamside forest of The Dover Trail near Sandspit on Moresby Island. This trail is named after a woman of Haida ancestry from Sandspit, and passes through the Damaxyaa Heritage Site and Conservation area. The creek is located east of Chaatl Island in Skidegate Channel, near Moresby Island. It is an old growth area where the trees and the forest floor are carpeted by bryophytes. “We had an early start (7 am) on June 21st to meet Marilyn our pilot from Moresby Explorers, with her Zodiac at the Queen Charlotte dock. After donning our large and extra-large raincoats, haha, we were off to Government Creek (Jiinanga) to explore the old growth Thuja plicata forest. 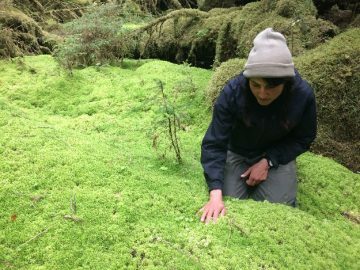 It was a bryologist’s dream, a thick carpet of bryophytes made for a comfortable walk and a place to sit in the forest. The weather cooperated again for us, we had the Bryophyte God smiling on us all week! We split into groups and went exploring and botanizing, and some of us made collections as this area hadn’t been explored by bryologists before. Another annual Schofield bryophyte & lichen foray has come and gone. Wilf Schofield’s collections from Haida Gwaii are extensive. 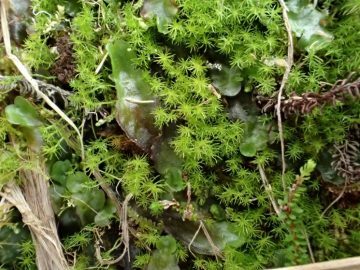 He probably collected all of the 395 species of mosses and many of the 180 species of liverworts recorded from Haida Gwaii at least once. In comparison, we only scratched the surface on this foray, and it will be a while before all of the collections are identified. Based on our observation, most of the species we collected were species expected to occur in the habitats visited. However, the collections could contain some uncommon species. For example Tetrodontium brownianum var ovatum in the Tetraphidaceae was collected in the underhang of a boulder by a creek draining into Takakia Lake. 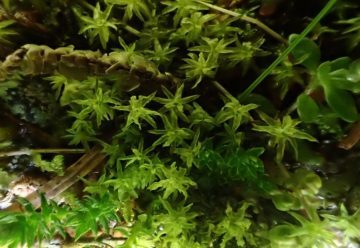 This might be the first collection of this moss for Takakia Lake. Additional interesting species may be found amongst these collections once the identification is finished. 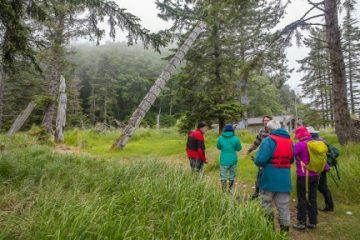 Some members visited the Vladimir J Krajina Ecological Reserve on the northwest coast of Graham Island on June 26th and the Moresby Camp area on Moresby Island on June 27th. 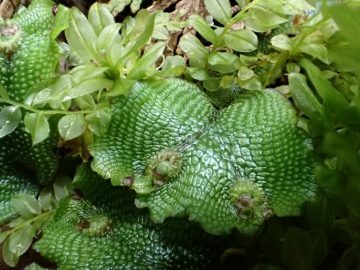 Karen Golinski found Paraleptodontium recurvifolium, one of COSEWIC’s species of concern at the Vladimir J Krajina Ecological Reserve. At the Moresby Camp area, Wynne Miles located a population of Zygodon gracilis, a red listed species in B.C., on a limestone cliff face.